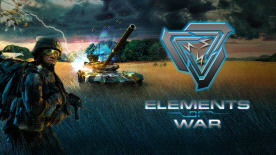 Elements of War – is a modern RTS set in the post-apocalyptic world suffering from a global technological disaster. The failed tests of experimental climate weaponry completely destroyed Washington, D.C., burying the government of the United States under ruins. In a sequence of ecological disasters all over the world, the European Expeditionary Corps was sent to the war-torn USA where different factions battle for control. The story of Elements of War will unfold gradually over the 12 missions of the single-player campaign, in which you will command the joint forces of Russia, Germany, France and USA. You will engage in thrilling battles enriched by highly detailed gameplay animations, realistic particle physics and dynamic weather that will affect gameplay directly. A variety of contemporary and modern military hardware aid you in restoring peace throughout the world. Use highly advanced weaponry to influence weather and climate to your advantage on the battlefield.